Get the MP3 audio and video from this show for only $5 more! 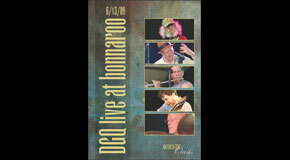 On a hot June day in 2009 the David Grisman Quintet played the Bonnaroo Festival in Tennessee for the first time. The band was in top form (David had already jammed with the Del McCoury Band and the Tony Rice Unit) and the crowd was energized. The Bonnaroo video crew captured the excitement as it was happening. The Quintet played a wide variety of tunes including some of their classics including— “EMD” and “Dawg’s Rag” as well as tunes from the Garcia/Grisman songbook, “Grateful Dawg” and “Dawg’s Waltz” plus newer pieces like “Newly Wedding.” This is the first new Acoustic Oasis video release with more on the way.